Socks. Ok, perhaps not the most exciting pieces of walking and outdoor kit - forgotten about almost as opposed the other essentials required for trekking. Well, of course. After all walking socks can't have anything like the immense technology which goes into a waterproof jacket these days... And surely socks are socks... one pair can't be any different to other? Well, all that is wrong. Socks are very important. And the specialist walking pairs do have masses of fabric technology in them. And if you've ever suffered from cold feet, itchy feet, blisters or sore toes whilst walking, then changing your socks to a pair of specially designed walking pair will make an amazing difference. One of those specially designed walking socks are the Extremities® range from British company Terra Nova. And as soon as you unwrap them from their packaging you immediately start to understand how their difference to the run-of-the-mill M&S stuff. For starters, the loop construction all the way up to the shin is designed to give greater comfort in stiffer boots. And that's just the beginning of the planning which have gone into these socks. There are no fewer than 10 versions of the Extremities range - each one proudly made in Britain. I tried the Hiker version, designed for use on year-round hikes and the more demanding backpacking trips. As soon as you put them on, you feel your feet starting to love you more. Your toes are the first to say thank you... they particularly like the specialised toe seams - finished by hand - which don't dig into your toes. Putting on your walking boots and you feel like you can walk for miles. 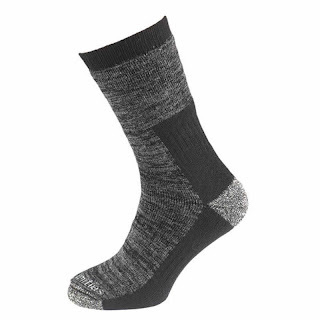 Whereas ordinary socks can rub along the in soul of your boots, the specially positioned padding, support areas and grip zones for the Hiker socks are all designed to stop that. As a result, steps are more comfortable and you feel like carrying on for longer. In the interests of testing - and to replicate a multi-day backpacking - I wore the socks for 3 days running... to see exactly whether they would carry on the rest of the walk on their own... And I can happily report that even after 3 days of constant wearing whilst walking, these Extremities socks didn't smell like I should have thrown them in the bin - and perhaps more importantly neither did my feet! The fact the Extremities socks are made in Britain at Terra Nova's factory in the Midlands only makes these socks even better. Excellent for walkers of all levels - in fact I feel sure if you've just started on the path of the walking hobby, then a pair of these socks will allow you to go further and keep your feet feeling loved. So... socks... pretty important then.